As you’ve probably gathered, the weather in southern Tasmania has been pretty awful, with unseasonal rain and colder weather. As we come to the end of November, it’s starting to feel like spring – about three months later than expected! This morning I couldn’t sleep, so was up and out in the yard before 7am. It was damp and cool, but lovely. Undoubtedly my favourite time of the day and the chickens and rabbits were happy to see me – and get an early breakfast! All the wet weather has played havoc with some of the plants. The few tomatoes I have outside are struggling, as are the corn and zucchini plants. Berries are the hardest hit, but my Chilcotin raspberries are in a raised bed and covered with bird netting so I think there’ll be a few sweet treats by Christmas. The boysenberry (a new addition) has set a few fruit so now the big issue will be keeping the birds off. 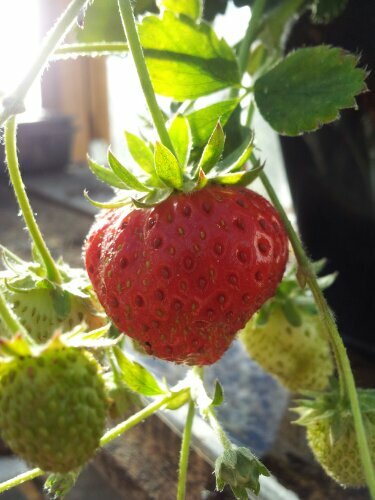 After the disastrous heat of last summer, I lost all but one of my strawberries. So in winter, I potted up the last little survivor and put it in the greenhouse for safe keeping, waiting for runners so I could propagate more plants.